The tricky part of this pattern is the missing 3rd down strum, it will take a bit of getting used. 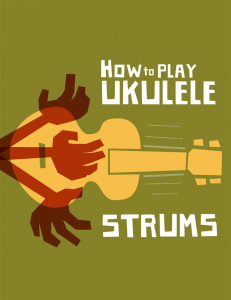 If you’re a newcomer to strumming and ukulele then I’d recommend playing it really really slowly to begin with. As ever aim for consistency first not speed. Play it as slowly as you need to in order to keep the rhythm going – even if it sounds ridiculous. The missing 3rd down strum gives a syncopated feel to the rhythm and that’s what keeps it sounding interesting. Any song with a 4/4 rhythm this will work nicely on – maybe it won’t match the original recorded strumming pattern but it’s a good basis for any rock/pop song. To begin with pick an easy chord (like a C) and repeat bar after bar until you’re almost on autopilot. Don’t worry about chord changes for now, just stick with a single chord until it’s firmly embedded in your memory and your hand is doing the pattern unconsciously . Once you have the pattern down with a single chord it’s time to throw a chord change (or two) into the mix. Again, I’d pick another easy chord like Am or F as we’re not working on your left hand here (unless you’re left handed that is). The final up strum is going to make it quite tough to change chord in time for the following down strum that starts the next bar so you need to anticipate the change and start the chord change as soon as you’ve played the 4th down strum. This will mean that for the final up strum your hand won’t actually be fretting a chord at all, it will be between chords, getting ready for the next bar. Don’t worry about this, if anything this will make your rhythm sound that little bit more natural. Practice this rhythm a little bit each day (add it to your practice routine) and before you know it you’ll have it perfected and can start applying it to songs that you know the chords for. 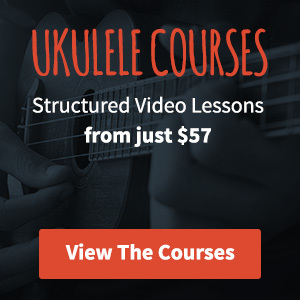 If this is the most important strum, I’m wondering why it doesn’t appear on the list of 32 ukulele strums? It’s almost #6 but not quite… Thanks for the resources, great site! It’s a good question. I consider it to be basically the same strum as no.6 and I use them pretty interchangeably. New to music. Left handed. You are the best instructor I’ve found in the whole World Wide Web. So, I’ve got the Uke upside down, I’m strumming with my left hand…do I reverse the strum pattern? Won’t it sound different if I don’t? ( I’m so clumsy yet, I can’t tell). Thanks for this great site.